Tailor assessments to every topic, skill, and concept taught in physical education. Help students make connections between concepts to enhance learning. Meet a wide range of learning styles and teach to all intelligences, including linguistic, spatial, visual, and kinesthetic. Incorporate learning into the assessment process by calling on various levels of thinking, such as recall, summary application, and evaluation. In today’s physical education framework, the demands on your time and energy are great. Every second of class time is precious, so an efficient method of assessment that can plug into any lesson or unit being taught is a highly sought-after commodity. Loaded with assessment templates and sample units, the Physical Education Assessment Toolkit provides you with everything you need in order to simultaneously assess and teach students the lifelong value of physical education. Bound-in CD-ROM—PDFs of each reproducible are provided for duplication, including posters that can be printed on letter-sized or larger paper in color or in black and white. Reproducible templates—Generic forms may be completed easily to address the specific topic, concept, or skill at hand, allowing you to tailor assessments to your students’ needs and abilities. Sample units—Designed using the backward design model of curriculum development, three complete units show how to transform blank reproducibles into highly practical assessment tools. Each chapter includes lesson plans with model reproducibles for the following categories: written assessment, self-assessment, peer assessment, and application or performance assessment. Within each of these categories, you’ll receive guidance on implementing and creating more meaningful assessments. Templates may be used to meet a variety of student learning styles, providing opportunities for assessing through rubrics, journal-writing assignments, self-assessments, and skill-tracking assessments across the cognitive, affective, and psychomotor realms. Rather than stealing valuable classroom time, the template approach actually enables teachers to use assessment to reinforce and extend learning in a systematic way. 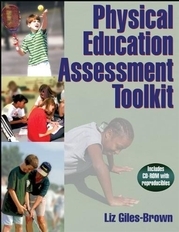 The Physical Education Assessment Toolkit is the one resource that physical educators will turn to anytime they need to do an assessment, no matter what unit or lesson is being taught. This book and CD-ROM package contains the ready-made, pilot-tested materials needed for effective assessments of students, leaving teachers to focus on what they do best—teach. Chapter 11. Fly Birdie Fly! Resource for elementary and middle school physical educators in grades 3 through 9; reference for physical administrators; supplemental text for PETE instructors. Liz Giles-Brown is currently a physical educator for grades K-8 at South Bristol School in South Bristol, Maine. In addition to having 17 years of experience teaching K-8 physical education, she has served as physical education curriculum chairperson and provided leadership in the assessment work done by her school union. Giles-Brown has also worked on state assessment development committees and currently serves on the expert review team for the Association for Supervision and Curriculum Development's (ASCD) Understanding by Design (UbD) online unit exchange. Giles-Brown has also written two units that have been published on the Understanding by Design (UbD) Exchange and has presented numerous assessment workshops for her peers in the field of physical education. Giles-Brown is a member of American Alliance for Health, Physical Education, Recreation and Dance (AAHPERD) and Maine Association for Health, Physical Education, Recreation and Dance (MAHPERD). In 2004 she received the Distinguished Leadership Award in physical education curriculum, teaching, and assessment from MAHPERD, which also named her Elementary Physical Education Teacher of the Year in 1995. Giles-Brown holds a master's degree in physical education, curriculum and instruction. She currently resides with her husband, Tim, and son, Chase, in West Boothbay Harbor, Maine, where she enjoys hiking, biking, boating, and skiing in her spare time.